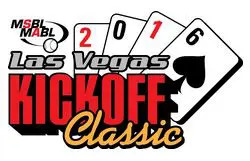 The Boston Wolfpack won the 45+ American Las Vegas Kickoff Classic with a 10-4 victory over the Paramount Pirates. The Pack went undefeated in pool round and secured the number one seed. Their win in Game three was against the San Francisco Giants and sometime Pack pitcher Oil Can Boyd. After defeating the Brew City Panthers in the semifinals, Boston faced the other division winner, the Paramount Pirates, who won an 11-10 walk off semifinal in extra innings against the Las Vegas Warriors. The Pirates scored first to take a 1-0 lead in the first. The Wolfpack got one back in the third inning as Panthers pitcher ‘Junior’ and Pack hurler Jim Kearchner pitched strong. In the 4th, a lead-off double by Larry See, followed by a home run by Jose Delgado, put Boston ahead for good, 3-1. The Wolfpack blew it open in the sixth on a 1-out double by Kamal Asar followed by a 2-run bomb by Mike Smith. Larry See then hit another double followed by three straight singles by Delgado, Dave Benedict and Russ Ward to put the Pack up 8-1. Smith put the exclamation point on the win with his second homer of the game, and third of the tournament, in the eighth inning. Kearchner pitched a complete game scattering nine hits and allowing only two earned runs. Lumpkins and Bravides had two hits apiece for the Pirates.